Data is the core of your applications. To keep it as safe as possible we offer a backup service that lets you backup your databases across locations. By doing cross-location backups you are ideally prepared for fail over scenarios. The backup service is available for all database services in our Cloud Foundry marketplace. Backups are stored in the object store in your prefered location and can be restored at any time. Flexibly schedule your service backups. All our datacenters are located within Europe and fulfill European privacy laws. How do I set up a service backup? 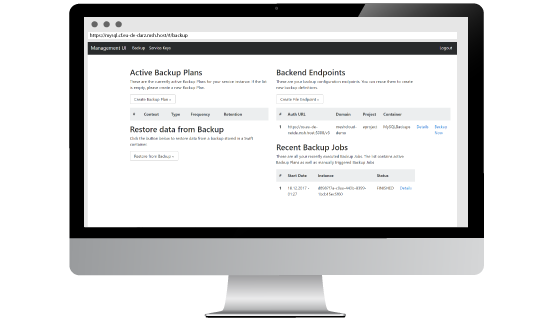 With our Service dashboards, setting up a backup plan is really easy. You can define different (Swift-)Endpoints in which the backup files will be stored. Furthermore you can set backup intervals as well as retention type and periods. Your database backups will be stored in the Object Storage of your favourite cloud location. Our object storage is based on OpenStack Swift. How do I restore a database from my backup file? You can restore your database from the service dashboard. You can either choose the service dashboard of your existing service or import the backup file into a service dashboard of a newly created service. In some cases you may want to transfer your whole application to another cloud location. You can easily achieve this when using Cloud Foundry and its data services, as long as you have a backup file for your database. Test the Meshcloud Platform for free. It’s easy. Sign up for free. Create a project. Deploy your first application. Here is our Step-by-Step Guide to deploying your first app to Cloud Foundry. Your registration is free. You have a free trial period of one month. After the first month, you will only be billed for the resources you use. If you do not deploy resources, there will be no charges to your account.